One of the less lauded games from Ultimate, PSSST! was one of my first experiences of a really slick and addictive Spectrum game. It was launched around the time of Jet-Pac, prior to the later and more popular isometric games. I remember cutting out the coupon in Sinclair User to order the game, paid for with a postal order for £5. No downloadable content and PayPal for us back in 1983! 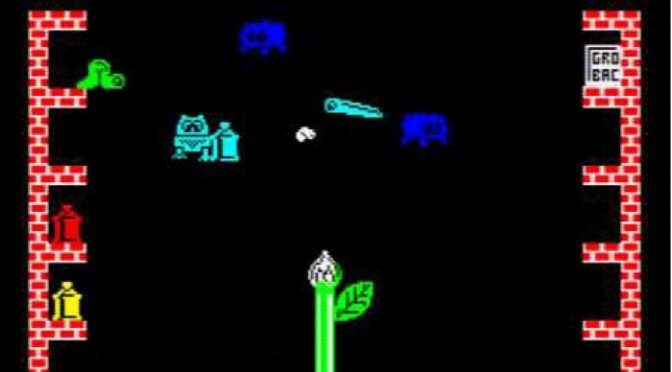 Back then you had to rely on a grainy screenshot if you were lucky, and the idea of Youtube to view gameplay was a fantasy. Playing the role of “Robbie the Robot”, your objective is to patrol your garden and protect your green shoot from invading insects long enough for it to grow and flower. The insects would crawl or fly towards the flower, and could be killed by using the right kind of spray for the insect – either a puff of gas, an electric zap or a water spray. The cans were dotted in alcoves by the side of the screen, and you could only carry one at a time, which forms the main game mechanic. You will encounter a number of different bugs as you progress through the game, starting with caterpillers and moving through bumble bees and wasps, each with a different attack pattern, and requiring different spray types. Survival of your flower was a frantic battle to keep swapping sprays and killing insects moving at different speeds towards your flower. Not the best or deepest game from Ultimate but a taste of things to come, and a world away from the clunky amd jumpy character animation of most early Spectrum games.